Probably the most frequent question I have gotten as a published author is this: Where do you get your ideas? My wife once asked me where I came up with all that stuff, though “stuff” was not her exact phraseology. Most writers have an active imagination and no dearth of ideas. The bigger problem for writers is culling their ideas to a manageable number. I have more book and story ideas than I have time and energy to write. The challenge is not to let new ideas overwhelm the old ones you’ve been developing. The more intriguing question of writers, in my view, is why they chose a particular genre or writing specialty. In my case, it was family and environment that pushed me to western fiction. 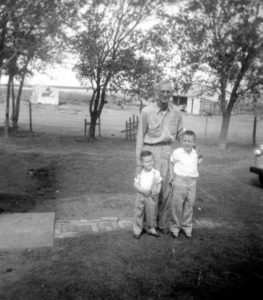 First, I loved to hear the stories of my Lewis aunts and uncles who grew up in the Great Depression as children of a tenant farmer. Their childhoods seemed more akin to life on the frontier than anything I was familiar with. Second, I grew up in West Texas where I was never far removed from cattle and the cowboy culture. Pop culture also influenced me. The most popular television shows of my childhood were westerns, which drove me to the library to read more on the history and lore of the Old West. For five years, we lived on a place east of Midland that had corrals and barns and a section of pasture I could explore. 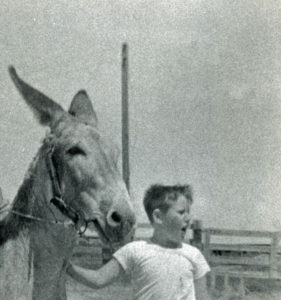 The Covington place was even more exciting when Dad bought my brother and me a donkey. We could put a bridle on “Flash,” as we called him, and ride the Covington range on our western adventures. One of my favorite photos growing up was a profile of me with Flash. We don’t have many of the photos of the Covington place that show the outbuilding and corrals, but I do have one of my little brother and me with our Lewis grandfather where you can see some structures in the background. The place was cowboy heaven for me as it was all the fun my imagination could create without all the chores of ranch work. The pivotal moment that branded a western fascination in my mind forever was when my parents during a vacation to Ruidoso made a side trip to Lincoln, where Billy the Kid roamed, fought and made his daring final escape. That excursion bridged the gap between my imagination and the West’s actual history, which is richer than the fictional West. I chose to write western fiction, however, because I didn’t have the patience and time to write history. Fiction satisfied my desire to write and to read history for background. Like Flash, it’s been a fun ride.